This entry was posted on April 15, 2016 by Zoe Thomas. Top marks for aesthetics. The latest redesign of the Evoluent mouse, the Evoluent C, is unlike any computer mouse I’ve ever used. It doesn't really look like a mouse. It looks more like something you might find in the Tate Modern and wonder what it’s saying about life. I’ve been lucky enough to have first dibs on this brand new piece of tech. 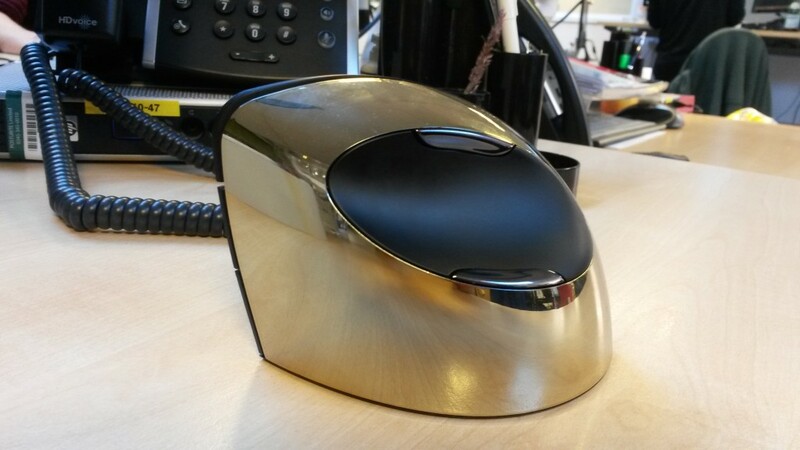 Its predecessor - the Evoluent VerticalMouse 4, is popular around head office but let's face it - it’s not as shiny as mine. At first I was dubious about using a vertical mouse. What’s wrong with a ‘regular’ mouse, anyway? Never say that in earshot of anyone who works at Posturite. It seems there’s a lot wrong with a regular mouse. You see, using a regular (non-ergonomic) mouse involves using the same small muscles repeatedly, which can lead to aches, pains and even MSDs like repetitive strain and carpal tunnel syndrome. A vertical mouse like the new Evoluent is upright, so you can avoid twisting your forearm into an unnatural position. This transfers any strain into the stronger shoulder muscles, which are altogether better equipped to cope with that kind of movement. The Evoluent C has a bigger ‘lip’ (the curve of plastic on the base) than the last version, to support your little finger and encourage a looser grip. Set-up is super easy. Just take it out of the box (an important bit), pull the plastic tab, insert the batteries (AA), remove the connector, plug it into your computer and you’re off, whizzing your cursor around your screen like nobody’s business. I must admit, it took a couple of hours to familiarise myself with where the left and right click buttons were because there’s a sneaky middle button that seems to have a number of functions, including deleting tabs when you click on them (helpful if you actually meant to), and scrolling through a document (again, helpful if that’s what you were expecting). I recommend reading through the instructions to really get a grip on this mouse’s various functions. Gadget-geeks will love all the nifty buttons that do various things, like changing the cursor speed, quickly jumping backwards and forwards through web pages and other things. I'll let you find them - it's all part of the fun. It’s a nice, smooth mouse to use - easy to move around thanks to the lack of wires, quick to respond - great for general computer use. I haven’t had any kind of aches or pains in my hands, arms, or shoulders as a result of using it, so it seems to be doing its job. It’s even got a little Evoluent logo which glows blue when you activate the mouse. Everyone likes a blue light. All in all, a high quality, flashy ergonomic mouse for those who care about their health as much as they do about their desk looking cool. Get your own Evoluent C here.